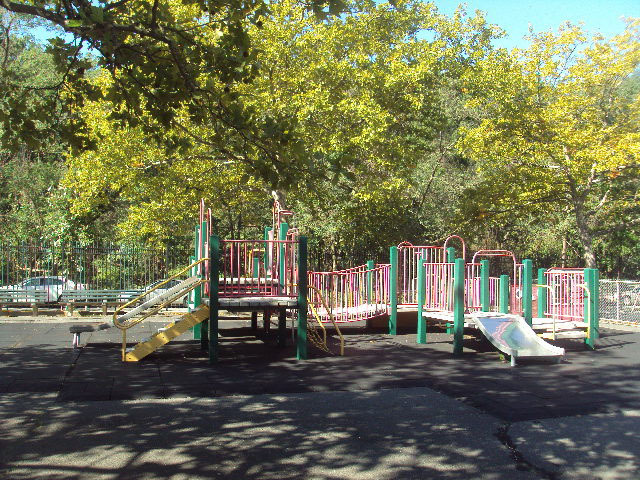 This playground was renamed in 1997 in honor of Christopher J. Prescott (1972-1994), a Staten Island native who was the first New York City EMS worker to be killed in the line of duty. The site was formerly known as Huguenot playground due to its location off Huguenot Avenue within the neighborhood of the same name. The Huguenots were a Protestant minority who fled religious repression in France for the promise of greater freedom in the new world. A small group of Huguenot and Dutch Walloon families made Staten Island’s first settlement in 1661, at Oude Dorp (later called Dover or Old Town), just south of the Narrows near South Beach. The neighborhood emerged two centuries later as one of many hamlets that developed near depots of the railroad, which opened in 1860. The playground, which is jointly operated by Parks and the Board of Education, was acquired for recreational purposes by the City in 1960. It opened to the public on December 13, 1967 to be enjoyed by students of the adjacent J.H.S. 7 and the local community. The playground was improved in 1996 with new modular play equipment and safety surfacing under a $145,000 capital project that was funded by Councilmember Vito Fossella. Fossella also introduced the local law to rename it for Prescott, a former student of the intermediate school. Prescott was educated at the Staten Island schools of P.S. 5, Bernstein Intermediate School, St. Joseph-by-the-Sea High School and the College of Staten Island. He joined the Emergency Medical Service in 1993 and was assigned to Station 34 in Brooklyn. His exceptional patient care and extra commitment to his co-workers during his first year earned him the title of “Rookie of the Year” from his colleagues who foresaw in Prescott a promising career. On June 17, 1994, Prescott and his partner were assisting a person injured in an automobile accident when a vehicle driven by a drunk driver struck the EMS crew and their patient. Prescott died from his injuries at Kings County Hospital.